YellowAirplane.com: SBD Dauntless, World War 2 Model Aircraft. SBD Dauntless World War 2 Propeller Fighter Model Aircraft Kits. Aircraft Plastic Model Kits, Die Cast Aircraft, Wood and Mahogany Aircraft Models. of the World War 2 Fighter Model Aircraft Department. SBD Dauntless Plastic and Die cast Models. Plastic Model Kits, Die Cast Aircraft Models, of all kinds especially aircraft models, are the most educational toys for kids and a fantastic Kids hobby. Made of Philippine mahogany, this 1/32 scale model measures 12" in length and has a wingspan of 15". Hand painted and detailed, model comes ready to display on the included mahogany base. During the Battle of Midway, Douglas SBD dive-bomber attacks fatally damaged all four of the Japanese aircraft carriers and heavily damaged two cruisers. an SBD-3 Dauntless flown from the doomed USS Yorktown (CV-5) in that battle, this limited edition, 1/72 scale, die cast Corgi model features engraved panel lines, a detailed cockpit with a sliding canopy, realistic dive brake flaps, forward-firing Browning M2 machine guns in the engine cowling, two 100-pound bombs on the wings and a 1,000-pound bomb in the centerline crutch, a rotating propeller, optional-position landing gear, authentic markings, and more. 6" wingspan; includes a display stand. a Dauntless flown from the USS Yorktown (CV-5) during the Battle of Midway in June, 1942, this 1/32 scale, plastic kit features clear, see-through fuselage and cowling parts to view the aircraft's exquisitely detailed interior! Other fine features include a fully outfitted cockpit and rear gunner's station with an optional-position canopy, photo-etched brass seat belts, and twin .30 caliber guns; split dive brakes complete with punched holes; a detailed R1820 engine; realistically molded bombs; grooved rubber tires; a choice of two markings (VS-56 and VB-3); and more. 15" wingspan; 257 parts, assembly required. A replica of the famous Douglas SBD-3 Dauntless dive bomber flown from the USS Enterprise (CV-6) during the Battle of Midway by Lt. Commander Richard Best of Bombing Squadron 6 (VB-6), this 1/18 scale, plastic model - which has a wingspan of more than 2-feet! - looks just like the real thing! Premium features include engraved panel lines and simulated rivets; a fully outfitted cockpit with flight controls, radio gear, and much more, all protected by sliding canopies; a rotating and elevating 7.62mm Browning machine gun that retracts into the cockpit; an intricate 9-cylinder Wright Cyclone R-1820-60 radial engine with a rotating propeller; two wing-mounted 100-pound bombs and a third, 1,000-pound bomb in the centerline crutch; movable flight control surfaces and working dive brakes; retractable landing gear with a steerable tail wheel and a tail hook; and authentic markings. Measures 22" long with a 27" wingspan and requires only a few minutes of simple assembly. This amazingly detailed 1/48 scale plastic kit features finely recessed panel lines, optional position dive flaps, a choice of opened or closed canopies, a detailed engine, a full bomb load, and much more, including decals for all sixteen of the VMSB-241 Dauntlesses that participated in the Battle of Midway. 10" wingspan; 110 parts, assembly required. an SBD Dauntless flown by VS-41 - the "Top Hatters," stationed on the USS Ranger (CV-4) - during Operation Torch, the invasion of North Africa in 1942, this 1/87 scale, die cast model features textured surfaces, a clear plastic canopy, realistic weapons, a rotating propeller, authentic markings, and more. 5" wingspan; includes a display stand. A stunning replica of the most famous carrier-based dive-bomber of World War II, this 1/48 scale plastic kit of the SBD Dauntless features scribed surfaces, a detailed crew compartment with pilot and gunner figures and a movable machine gun, retractable landing gear and movable dive brakes, a releasable bomb, a choice of U.S. or RNZAF markings… even deck handler and signal officer bonus figures! 10" wingspan; 53 parts, skill level 2. Although slower and relatively out-gunned by enemy aircraft when it entered service in 1940, the SBD Dauntless was rugged and dependable, which helped it sink more Japanese vessels than any other Allied dive-bomber during World War II. Number 22 in the Oxford Diecast series of 1/72 scale, die cast warplanes, this model of an SBD-5 Dauntless flown on anti-submarine patrol missions by Maj. Christian Lee of the VMS-3 "Devilbirds" in 1944 features engraved panel lines; a detailed cockpit with a glazed canopy; simulated "Swiss cheese" dive brakes; wing- and fuselage-mounted bombs; and an authentic, two-tone paint scheme with authentic markings. 6" wingspan; arrives ready to display on the included stand that identifies the plane and pilot. A replica of the SBD-5 Dauntless, which was, from mid-1940 until late 1943, the most heavily produced variant of the U.S. Navy's main dive bomber, this kit features laser-cut balsa parts, vacuum molded parts, covering tissue, decals, step-by-step instructions, and more. For display or electric-, gas- or rubber-powered flight, it has an 18" wingspan. Assembly required. an SBD-5 Dauntless dive-bomber flown on Atlantic anti-submarine patrols by Major Christian Lee of VMS-3, the "Devilbirds," stationed at St. Thomas, Virgin Islands, in 1944, this 1/87 scale, die cast model features textured surfaces, a clear plastic canopy, rearward-firing machine guns, a rotating propeller, authentic markings, and more. 5" wingspan; includes a display stand. the Dauntless dive-bomber flown by Flying Officer Leslie McLellan-Symonds and Flight Sergeant R. F. Bailey of No. 25 Squadron, Royal New Zealand Air Force, when they attacked Japanese forces on Bougainville and at Rabaul in March, 1944, this 1/72 scale, die cast Hobby Master model is a real beauty! Fine features include engraved panel lines and simulated rivets, a detailed cockpit with an optional-position canopy and two crew figures, a movable bomb crutch (with a 1,000-pound bomb!) and rear gun, two wing-mounted 100-pound bombs, a rotating propeller, optional-position landing gear with an arresting hook, and authentic markings, including nose art depicting Donald Duck carrying a bomb and the crew nicknames "Mad Mac" and "Syncopation" under the cockpit sill. 6" wingspan; includes a display stand. Dressed in a colorful pre-World War II livery, this 1/72 scale die cast model of an SBD-3 Dauntless features engraved panel lines, a rotating propeller, optional position landing gear, a bomb load, and more. 6" wingspan; includes a display stand. Douglas SBD-3 Dauntless 1/32 Die Cast Model - Signature Ed. the Dauntless dive-bomber flown by 11-victory ace Lt.(jg) Stanley "Swede" Vejtasa and radioman Frank Wood off of the USS Yorktown (CV-5) during the Battle of Coral Sea on May 8, 1942, when Vejtasa shot down two A6M2 Zero fighters and cut the wing of a third with his wingtip in a head-on pass, this limited edition, 1/32 scale, die cast Hobby Master model includes a metal display stand nameplate that has been hand signed by "Swede" Vejtasa himself! Exceptional features include simulated rivets, a detailed cockpit with a sliding canopy and two crew figures, an engine cowling that can be removed to reveal a finely detailed radial engine, a movable bomb crutch (with a 1,000-pound bomb! ), two wing-mounted 100-pound bombs, a movable .30 caliber machine gun and a rotating metal propeller, working dive brakes and optional-position landing gear with an arresting hook, and authentic VS-5 markings. As an added bonus, you even get a FREE transparent engine cowling. 15" wingspan; arrives ready to display. For "contributing materially" to the destruction of a Japanese aircraft carrier on May 7, 1942, during the Battle of the Coral Sea and then, just one day later, "displaying extraordinary skill as an airman and the aggressive spirit of a fighter in repeated and effectively executed counterattacks against a superior number of enemy planes" despite being seriously wounded, Lt.(jg) William E. Hall was awarded the Medal of Honor. A replica of the Dauntless flown by Hall that day, this limited edition, 1/32 scale, die cast Hobby Master model is a fitting tribute to an American hero. Exceptional features include simulated rivets; a detailed cockpit with a sliding canopy and two crew figures; an engine cowling that can be removed to reveal a finely detailed radial engine with a rotating metal propeller; two wing-mounted 100-pound bombs and a movable bomb crutch with a 1,000-pound bomb; a movable .30 caliber machine gun, working dive brakes, and optional-position landing gear with an arresting hook; and authentic markings. As an added bonus, you even get a FREE transparent engine cowl. 15 " wingspan; arrives ready to display on the included metal stand. Balsa Wood Model Aircraft Kit. Pre Built Mahogany Aircraft Models. Made of Philippine mahogany, this 1/32 scale model measures 12½" in length and has a wingspan of 15½". Hand painted and detailed, model comes ready to display on the included mahogany base. This collector clock features the Dauntless dive-bomber in flight, framed in a distinctive riveted aluminum case. Also features a quartz movement, requiring one AA battery (not included). 15" diameter. June 4, 1942, 10:00 a.m. - Douglas SBD Dauntless dive bombers are about to deliver the turning point of the War in the Pacific. Limited edition of 1250, S/N by artist. 35"x 23" print. Dauntless dive bombers begin their attack at the Battle of Midway. Limited edition of 300 prints signed and numbered by artist is based on the mural that Stan painted for the new Palm Springs Aviation Museum. 45"x 15½". Signed by Lt. Cook Cleland, pilot of a Dauntless flying off of the USS Lexington, this limited edition print features a wonderful depiction of the Dauntless and also documents the amazing wartime exploits of Lt. Cleland, winner of the Navy Cross in the Battle of the Philippine Sea. Print measures 18"x 12" and is also signed by the artist. This poster features four of the U.S. Navy's most significant aircraft of World War II's Pacific Theater: the Brewster Buffalo, the Navy's first all metal monoplane fighter; the Grumman Wildcat, the frontline fighter of the early war years; the Douglas Dauntless, which was the standard for U.S. Navy dive bombers and which was instrumental in the victory at Midway; and the Grumman Bearcat, which at the end of the war raised the bar for propeller-driven fighters. 14"x 24". Click Here's another great book that I found on another site that covers the SBD Dauntless Dive Bomber. Writen by Daniel V. Hernandez. 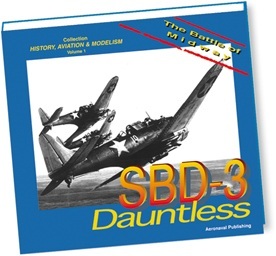 Learn Easily Aerodynamics, Flying Procedures, Systems and other Technical Concepts, as well as its Development through the Description of the SBD-3 Dauntless. From the Webmaster. I have looked at this site and the book looks great, one of the best that I have seen. C. Jeff Dyrek. Marii Chernev. In August 1942, Dauntless dive-bombers flown by Robert C. Shaw and Harold L. Jones off of the USS Enterprise near Tulgi were attacked by two A9M2 Zero fighters from Rabaul. The lead Zero was flown by Petty Officer Saburo Sakai, who sustained grievous injuries from the return fire from the SBD-3s. Though blinded in one eye, Sakai managed to fly more that 500 miles back to Rabaul.Print measures 25"x 18". David Gray. At the Battle of Midway on June 4, 1942, Lt. (jg) Norman "Dusty" Kleiss pulls his Dauntless skyward as he inspects the devastation inflicted by his bombs on the forward elevator of the Japanese aircraft carrier Kaga and as his gunner, ARM3c John Snowden, skillfully manages to keep pursuing Zeros at bay. 32"x 23" limited edition, numbered print is signed by the artist and by U.S. Navy Captain Norman Kleiss.